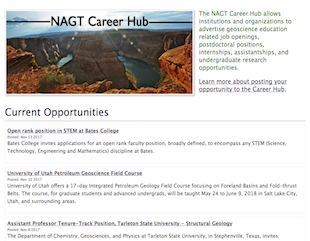 The Association and Sections of NAGT routinely post news releases to the NAGT Website. The most recent of these releases are displayed on the front page of the website, and all current news releases are available for viewing at the link above. 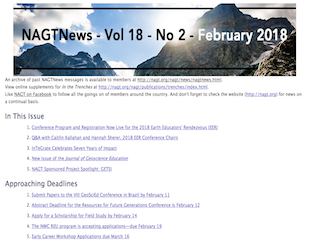 The NAGTNews is distributed by email once a month to all members who have an email address in their membership record (you can update your email address in the secure member services area). These monthly emails draw members' attention to news items and events of a more imminent nature and complement the longer-form In the Trenches magazine issues. Members can also access the archives of these email messages for reference purposes. 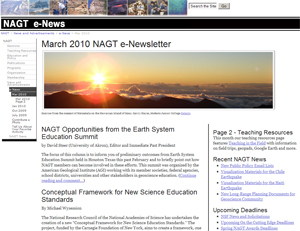 In 2009 and 2010, NAGT published this electronic news magazine quarterly and it went out to all the members of the organization. This magazine contained extended articles drawing together threads of news from the Sections and the Association to give members a larger sense of what's going on in Geoscience Education across the US and Canada. You can read the archived issues of the e-News by clicking the link above. You can also view the online supplements for In the Trenches, the print magazine for members begun in 2011.